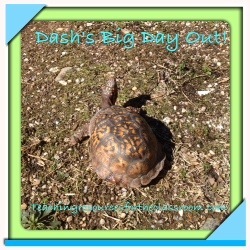 Our new class pet, Dash, went for his first walk about today! We believe he was in an induced hibernation. So he has has been a little slow to get going. Also when we put him in water (shallow water) he tried to fully submerge his head as if he was desperate for hydration! Box Turtle do not swim and easily drown but like any living thing they need water. I have been keeping his habitat moist and spraying him several times daily. Box Turtles are an easy classroom pet. They really need a habitat that is based on things you find outside your back door! After a quick spritz of water and sunbathing for a moment Dash was on the move. I’m not sure how long it had been since he had been out but he seemed to truly enjoy it!